*This post was contributed by our guest t-shirt blogger Blake from You Design It. Contact him if you need custom t-shirt printing. While I’m not an affiliate for any products or services, I feel like I should help do my part to spread the word for Go Media’s latest announcement.Â These guys have done such a great job of improving the t-shirt industry through tutorials, artwork, and trendsetting. 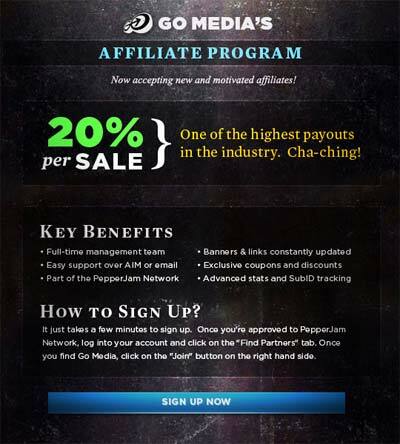 The concept of affiliate networks on the internet has been around as long as e-commerce.Â The affiliate sales process has been improving over the years and PepperJam (their network provider) has been experiencing explosive growth in the affiliate network space. Pairing them up with Go Media is a match made in internet sales heaven. Go Media continually puts out new products on a regular basis and they stay in front of the curve with cutting-edge designs.Â Sounds like a win-win situation for everyone.Â Click on the image below to head over to the sign-up page.